The Del Mar Thoroughbred Club opens it's 2016 season on Friday, July 15, and runs through Labor Day, September 5 and features an array of epicurean events in addition to 11 musical performances. The historic racetrack has announced that it will host the first annual Del Mar BBQ State Championship, which will take place on the Sunday, July 17, 2016 anchoring Opening Weekend of the Del Mar Racing season. 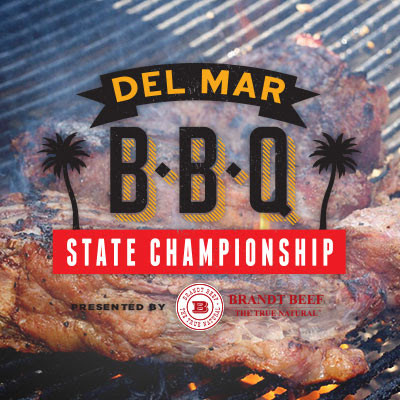 The Del Mar BBQ State Championship is presented by Brandt Beef and will feature over 40 professional BBQ Pitmasters, local restaurants and chefs who will be competing in the contest. BBQ samples will be for sale to the public for the chance to win the honor of being named the People's Choice Champion. Two tickets to compete in the World Food Championship will also be awarded at this year's Championship. The event will take place at the Seaside Concert Area of the Del Mar Race Track and will be a free event for all ticketed track attendees. Guests should arrive to event with a big appetite to sample the competition-ready meats, including brisket, pork, ribs, chicken and steak. BBQ samples will be on sale starting at 12 pm until 5 pm or until the teams run out. Guests ages 21 and over will also be able to enjoy local craft beer to pair with their succulent barbecue samples. Kansas City Barbecue Society (KCBS), the sanctioning body for this contest, will feature the top BBQ Pitmasters from around the United States who will be competing for over $15,000 in cash prizes, awards and local notoriety. KCBS is the world's largest organization of barbecue and grilling enthusiasts with over 20,000 members worldwide. KCBS endorses over 500 barbecue contests coast-to-coast throughout America, where competitions for barbecue chicken, ribs, pork and brisket are served up and judged by Certified Barbeque Judges. KCBS is the most respected judging body in America because of its blind judging process that uses a weighted scoring index to ensure a level playing for all competitors. The organization also trains and commissions Certified Barbeque Judges at classes held across America. CBJ's learn how professionals distinguish great barbeque from fare based on three important elements: appearance, taste and texture. Proceeds from the sale of barbecue samples will benefit the Emilo Nares Foundation, which provides transportation for low-income children who need to get to their medical appointments.